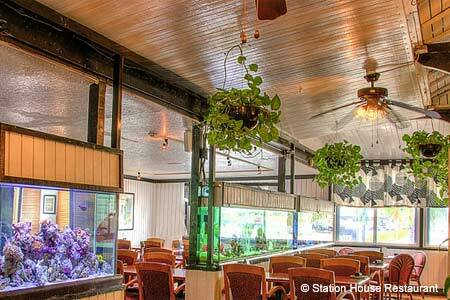 A classic South Florida seafood house where the specialty is---what else?---Maine lobster. : This South Florida seafood dinner house caters to a regular clientele made up of mostly business and country club types. But during Maine's peak lobster season (June through December), the Station House totally packs 'em in for its whole live lobster specials; the immense quantity sold keeps prices affordable. Lobsters are of a quality that simple steaming is the best way to keep the delicate meat moist and tender. But there's a break for baked/broiled stuffed lobster fans: the eatery sells à la carte orders of its famed crab meat stuffing, so it's possible to enjoy the best of both worlds. Other lobster dishes include lobster marinara over pasta, creamy lobster bisque, and scampi-style lobster in garlicky white wine-butter sauce. Of course, there are other seafood options, mainly prepared in American or Italian-American styles, plus beef, lamb, poultry and pasta dishes for the non-seafood eaters. The wine list is fairly extensive but not very sophisticated, with the total absence of any of France's seafood-appropriate white wines---no Muscadet, no Sancerre, not a drop of Condrieu (lobsters' BFF)---particularly disappointing.